Sammy uses a paintbrush attached to a rubber bone, to paint a canvas at a gallery in Salisbury University, Salisbury, Maryland, USA. Mary Stadelbacher is the founder of Shore Service Dogs in Salisbury, Maryland, providing custom trained service dogs to assist people with limited mobility by closing car doors, taking laundry out of the dryer, helping the person out of a chair, etc. 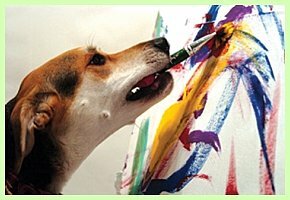 Several years ago, she figured if the dogs could learn to do those complicated tasks, they might be able to learn to hold a paintbrush and paint. Mary Stadelbacher has Sammy take off one of her socks during a demonstration at Salisbury University. 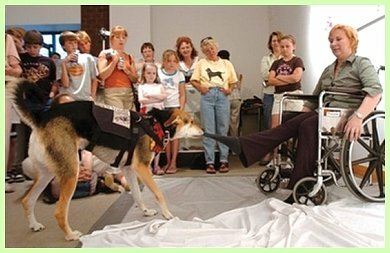 Now she has successfully trained some of her dogs to paint. The resultant paintings are happy, free-spirited, color-splashed abstracts. They are daubed by her three service dogs Major, Kayne and Sammy, who were all rescued from abandonment or abusive situations and trained to be service dogs by her. 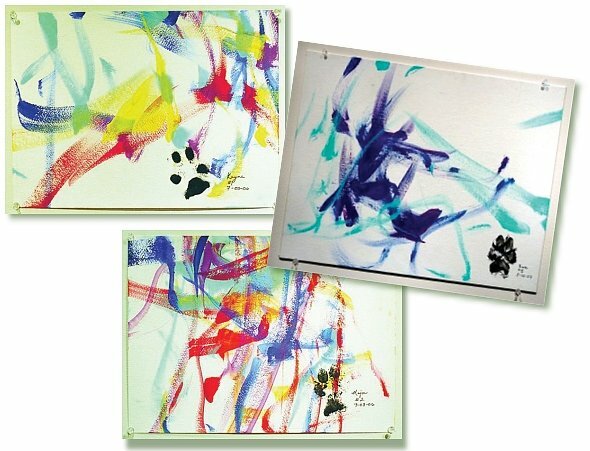 Each painting is signed with the artist-dog’s paw print. The paintings are for a donation with proceeds going toward Shore Service Dogs’ training and upkeep.